In case you weren’t aware, there are a lot of books in the world–far too many to read in a lifetime. Consequently, many good, dear books get pushed underneath the best-selling and award-winning ones. And that’s just how the world works, I guess. But every once and while, those other good, dear books need some love, too. Meliara and her brother promised their dying father to free Remalna from a bad king’s oppressive rule and to preserve the vital Covenant with Remalna’s aloof, unhuman Hill People. Meliara, the stubborn barefoot countess, is determined to win or die fighting. But she not only has the evil king to contend with, there’s the elegant Marquis of Shevraeth, who always seems to be one step ahead . . .Brought to court by a mysterious letter, young Countess Meliara finds herself the subject of courtly intrigue, both sinister and romantic, on the part of the deposed king’s sister, the enigmatic Marquis of Shevraeth, and a secret suitor. Meliara has to contend with the mysteries of politics and the mysteries of romance. Is risking your life less dangerous than risking your heart? Crown Duel, and its sequel Court Duel (which are often published in a single book), is a delightful little piece of fiction that rarely gets the love it deserves. (I think I’ve met one or two other people who’ve read this book.) I heard about this book from leader at a youth camp I attended years ago, and I’m so glad I did because this book is a right gem. The main character, Meliara, is such a wonderful protagonist. She’s kind and passionate and unconventional, but she also has a lot flaws (flaws that constantly get her into trouble). She progresses and grows so much throughout the two books, which, to me, is such an important thing in a character. She realizes (albeit sometimes unwillingly) her faults and does her best to correct them. A+ human, right there. The romance is also 10/10 and rather catches you by surprise. (At least it did when I was fourteen years old. If I were to have read this as an adult, it would probably seem more obvious, but I imagine it would still be delightful to discover all the same.) I’m ever the fan of Pride and Prejudice-esque love stories where the two hate each other before they realize they’re totally in love. If any of you sympathize can with me, definitely give this book a try. Actually, just give this book a try, period. 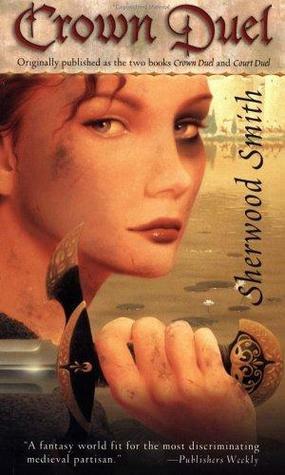 It’s a great fantasy novel and deserves much more love than it receives!